The Warsaw ghetto uprising began after German troops and police entered the ghetto to deport its surviving inhabitants. It took the Germans a month to crush the resistance. In the summer of 1942, about 300,000 Jews were deported from Warsaw to Treblinka. When reports of mass murder in the killing center leaked back to the Warsaw ghetto, a surviving group of mostly young people formed an organization called the Z.O.B. (for the Polish name, Zydowska Organizacja Bojowa, or Jewish Fighting Organization). The Z.O.B., led by 23-year-old Mordecai Anielewicz, issued a proclamation calling for the Jewish people to resist going to the railroad cars. 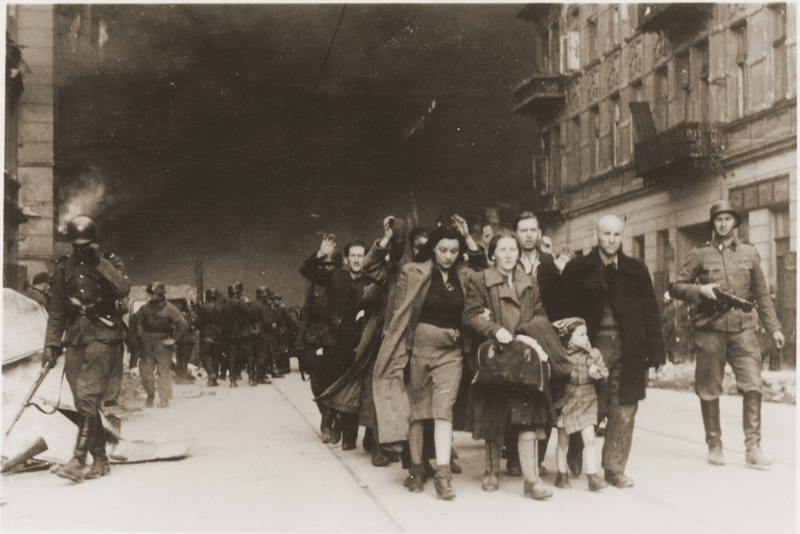 In January 1943, Warsaw ghetto fighters fired upon German troops as they tried to round up another group of ghetto inhabitants for deportation. Fighters used a small supply of weapons that had been smuggled into the ghetto. After a few days, the troops retreated. This small victory inspired the ghetto fighters to prepare for future resistance. On April 19, 1943, the Warsaw ghetto uprising began after German troops and police entered the ghetto to deport its surviving inhabitants. Seven hundred and fifty fighters fought the heavily armed and well-trained Germans. The ghetto fighters were able to hold out for nearly a month, but on May 16, 1943, the revolt ended. The Germans had slowly crushed the resistance. Of the more than 56,000 Jews captured, about 7,000 were shot, and those who remained were deported to camps. April 19, 1943 - May 16, 1943 News articles about the Warsaw ghetto uprising and destruction of the ghetto. April 1943 - June 1943 News, editorials, op-eds, letters to the editor, and cartoons reacting to the Warsaw ghetto uprising and destruction of the ghetto. September 1943 - May 1944 News, editorials, op-eds, letters to the editor, and cartoons reacting to the Warsaw ghetto uprising and destruction of the ghetto. This includes articles marking the one-year anniversary of the event in April-May 1944.